Many people are trying to save money these days. Of course, there are multitudes of ways you can do it if you are one of them. But I’ve found one of the simplest solutions to fix your budget problems. 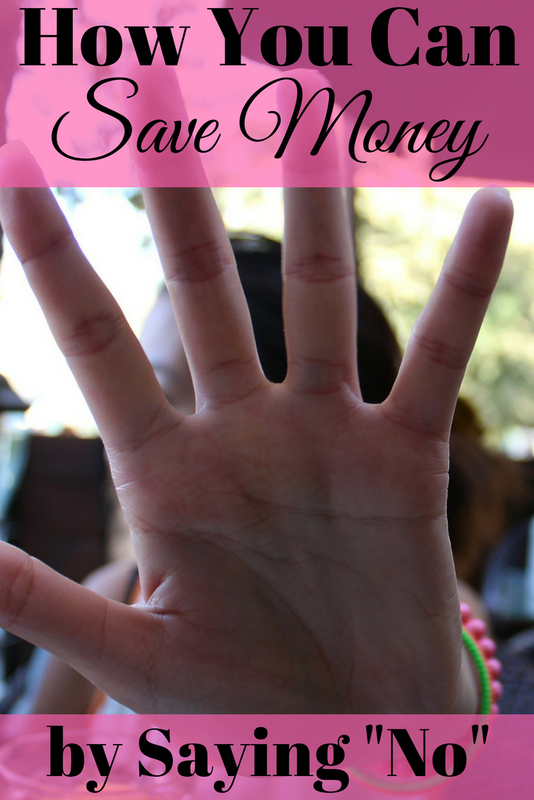 If you really want to improve your finances, save money by saying “No”. Shopping is a big problem for some people. For me the solution is simple because I live in a very small town. The only way for me to shop is traveling literally hours to a city, or ordering off the internet. Since traveling costs gas money, my husband and I don’t do it very often. As far as ordering off the internet, I have almost stopped doing that. To stop placing internet orders I have done a couple of things. First, I get rid of catalogs the moment they enter my home. Out of site is out of mind and if I don’t look, I am not tempted. Secondly, I delete those email offers I get unless it is a discount for an item I truly need. When you want to save money on shopping, do what I did. Just say no to those email offers and catalogs without even looking at them. If you want to save money by saying no, try saying it when you are asked to take on extra work. Obviously it could mean extra pay in the form of overtime for you at your job. But is it worth the extra stress? Consider that working overtime or extra could mean you order more takeout food. That extra work means extra expense. In fact, you could end up spending more for that convenience than you are making by working extra. Another way you can save money is to say no to bad habits. Those bad habits could be anything from drinking too much to not budgeting. If you want to make your finances better, you have to look at all of the ways and reasons you spend money. That includes outside influences, such as friends and family, and how they impact your budget. It’s easy to be envious of others when they appear to have more than you. However, keep in mind that those fancier, newer cards or houses cost them money too. Just because they have name brand clothes it doesn’t mean they don’t have debt. Resist the temptation to compete or compare yourself to the Joneses. Say no to new stuff just because a friend or neighbor has it. That isn’t a good enough reason for you to go into debt too. If your own family is struggling, why would you loan money to a friend or family member? You could end up putting your own family in financial peril. Save money by saying no when they make such requests, even when it is difficult. When you make budgeting errors or your budget isn’t working at all, resist the notion of scrapping it. The odds are that you will save money by using a budget of some kind. Instead, consider trying something else. Check out the cash envelope budgeting system or the zero –based budget. Look at other budget alternatives and try them one at a time to find the one you like best. Everyone gets busy and it’s easy to procrastinate when it comes to budgeting and saving money. Still, if you want to save, start by saying no to putting it off any longer. Get a budget made, organize your bills and filing, and use a calendar to keep track of bill due dates. Nobody is going to do the work for you. You have to start saying no to procrastination and get your finances in shape. As you can see, there are lots of ways you can save money by saying no. Why not start today and start saying no too? You might be surprised by how much you can save. Have you ever saved money simply by saying “No”? Your welcome! Thanks for your comments and good luck. I hope you can save a lot for your future. Oh yes, and after a while it becomes a habit and fun. It’s just sometimes a little awkward when your friends act like they always did and don’t understand why you’re doing this. Yes, saving does become fun. You can challenge yourself to see just how much you can save each month. It is hard to get friends and family to understand why you are declining them sometimes. But perhaps you can choose cheaper alternatives instead some of the time. These are good tips on saving money, but if your character is to spend there is not much you can do about it! I understand, but that’s kind of my point. We have to hit the pause button and stop and think before just saying yes to more spending. It doesn’t mean you have to change everything all at once. Make little changes like getting rid of the clothes catalogs. Unsubscribe to some of the sites that tempt you. As you examine where you can make changes you should start seeing savings. I wish you luck in your money savings efforts! Procrastination comes in all forms, and you are right, it is prevalent when it comes to saving money as well. Thank you for sharing these awesome tips about saving money. Great blog! Thanks for you kind words! I think many times we complain about not saving money or not having enough. But the truth is, are we doing everything we can to save more or make more? If we are honest, the answer, at least sometimes, is probably going to be no. That doesn’t mean saying no to some things is easy, though! Thanks for your comments!